How do we measure earthquake strain energy? Hi David. Firstly, this is not a basic question at all. In fact, it’s one that is of considerable importance. Your question has two parts and I’ll address them individually. 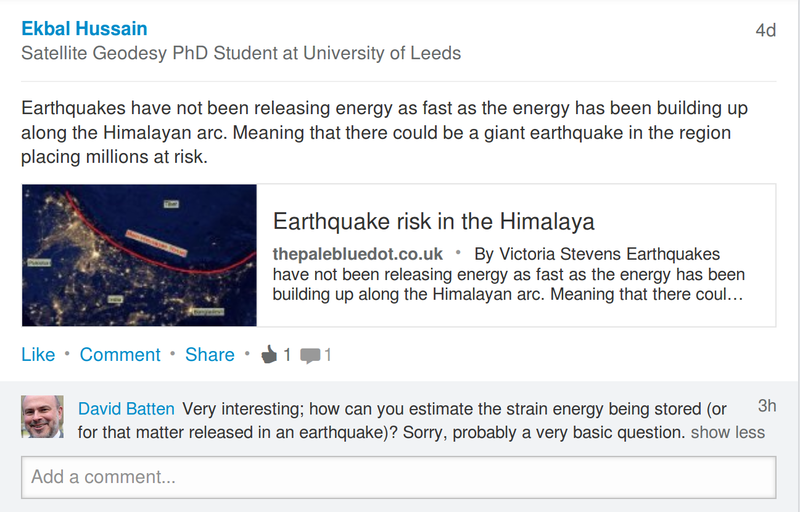 How do we measure strain energy released in earthquakes? The main way we do this is by measuring how much the ground moves in an earthquake, this can be done with high precision GPS instruments on the ground or from space based satellite measurements. Here’s an example from the giant Tohoku earthquake, that struck Japan in 2011, of what we can do with GPS instruments. Each little arrow is a GPS station and it records how much the ground moved during the earthquake. We can use these kind of measurements to calculate how much the ground has moved all along the fault and at depth during an earthquake. Once we have the full displacement of the fault we can relate that directly to the stress drop and strain release. How do we measure strain energy being stored on faults? A similar method is used to determine strain stored on a fault. The ground very slowly warps itself around a locked fault in the decades to centuries before an earthquake. Here’s an animated model of what I mean (might need a screen refresh to play it). Imagine looking down onto the ground from above with the top half of the earth moving to the right and the bottom moving to the left. If we can measure the degree of warping before the earthquake, again by using GPS and satellites, we can relate that to the strain energy getting stored on the fault. Here represented by the different colours, with red being the area of highest strain storage.